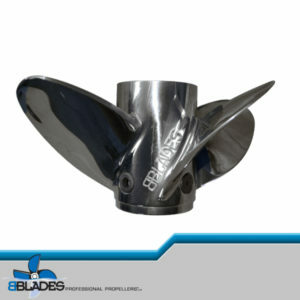 BBLADES Professional Propellers welcomes you to the next generation of Bravo–style sterndrive and large outboard propeller technology: the new BBLADES 4–SPEED™, designed for sterndrive applications, and 4–SPEED OB/FX™, designed for outboard applications, are propellers with 21st Century geometry that makes it easier than ever to improve performance on air entrapment, multi–stepped and deep V hulls. 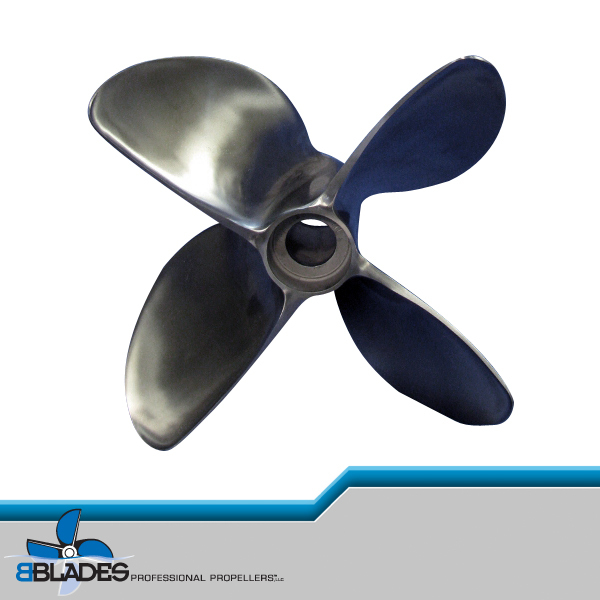 Both 4–SPEED propeller designs are investment cast from 15–5 grade virgin stainless steel. Both models are perfectly balanced and heat–treated. Both are available in Right–hand and Left–hand rotations in two–inch pitch increments from 24” – 34”. The 4–SPEED sterndrive propeller is cast at a true 15.5” diameter. The 4–SPEED OB/FX is available in 14.75” or 15.25” true diameters. 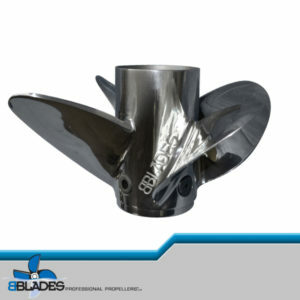 The larger diameters available on each propeller help the blades hookup in the aerated water produced by stepped and air entrapment hulls. This holds true for drives mounted at aggressive X-dimensions, as well as higher outboard engine mounting installations. The overall geometry and strength of the propellers make them ideal for Custom Lab Finishing or other specific applications. The blade design is key to the performance and efficiency of these revolutionary new castings using variable cord length throughout the blade area. ‘Cord length’ is the distance between the leading edge and trailing edge of the blade at any given point along the blade. At the ‘blade root,’ where it attaches to the hub, a long cord length helps to get a boat on plane. Once there, the prop needs less surface area meeting the water to maintain top speeds and a substantially reduced cord length at the blade tip allows for the most efficient performance throughout the RPM range. The BBLADES 4–SPEED also helps deliver rapid planing through an extended exhaust tube length, which then increases overall hull lift as an extended planing surface. The tube doesn’t have the ‘flair’ common on other propellers, meaning reduced drag and increased top-end. 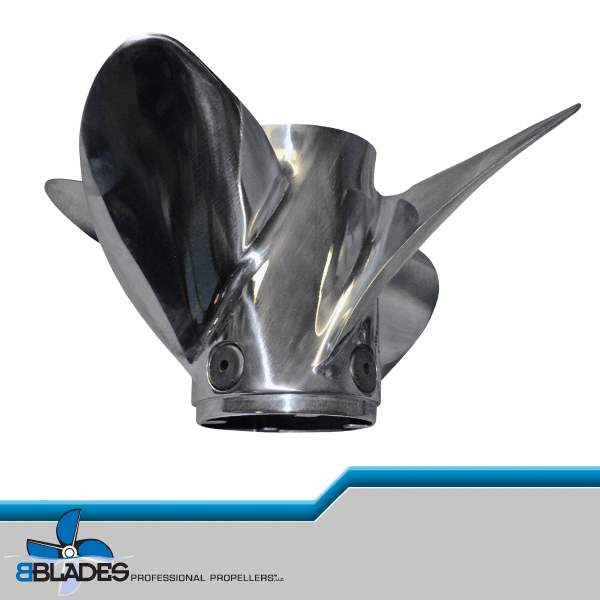 If your set-up doesn’t require an extended exhaust tube, the new BBLADES 4–SPEED propeller can be easily modified by BBLADES technicians to the exact length required for your application. The BBLADES 4–SPEED OB/FX has an adjusted exhaust tube to allow for a slight additional amount of ventilation when planing. 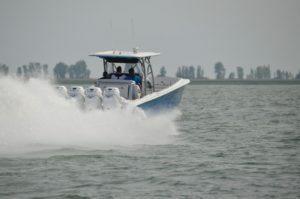 The 4–SPEED OB/FX has also been equipped with custom cupping and rake adjustments to aid in increasing trim reaction important for today’s “C.G.” forward center console boats. Like the other custom BBLADES propellers, the new 4–SPEED and 4–SPEED OB/FX are equipped with an adjustable Controlled Aeration Port System (CAPS). These ‘vent holes’ allow for additional control of the aeration around the propeller blades. Unlike other systems, the BBLADES 4–SPEED and 4–SPEED OB/FX tunable 7/8” CAPS are a full ¼ of an inch larger, and the three variable size plugs are made of a pliable rubberized material, meaning they are reusable and can be swapped out while the propeller is still on the drive. The new BBLADES 4–SPEED and 4–SPEED OB/FX are the latest in the BBLADES family propellers being developed to offer the broadest flexibility in matching purpose–designed propellers that are easily customizable within their performance parameters.